We’d love your help. Let us know what’s wrong with this preview of Say What You Mean by Oren Jay Sofer. How to speak and listen more effectively--to communicate mindfully and improve all relationships--based on the author's unique synthesis of mindfulness practice combined with the principles of nonviolent communication. Communication is hard. Here's a proven method that makes it not only considerably easier, but also much more effective for people on both sides of the conver How to speak and listen more effectively--to communicate mindfully and improve all relationships--based on the author's unique synthesis of mindfulness practice combined with the principles of nonviolent communication. To ask other readers questions about Say What You Mean, please sign up. What we say matters. This book came at a great time for me and was a powerful read of helpful advice based on the mindfulness practice, to have more positive communication. Words can heal, sooth or uplift us and they can also cause great harm. 2. Co What we say matters. This book came at a great time for me and was a powerful read of helpful advice based on the mindfulness practice, to have more positive communication. Words can heal, sooth or uplift us and they can also cause great harm. 2. Come from curiosity and care. 3. Focus on what matters. I love the advice in this book and so many of the points have really stuck with me. I love the chapter that talked about self-awareness and how this can affect the communication we have with others. We need to show up for ourselves and others and sometimes taking a pause before speaking can really help with this. The more aware we are the more choices that we have. We also must have trust and confidence in our own voices. 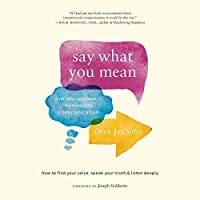 "Say What You Mean" is an excellent resource for anyone interested in learning how to authentically connect and communicate with ease and clarity. I loved it! I have dog-eared many pages and underlined numerous sections. There are also 12 free guided audio meditations that I use to support my daily practice. It is a book that I will go back to again and again. This brilliant book opens with a perfect analogy: “Communicating is a bit like learning an instrument. Playing scales is essential, but the aim is to make music.” I smiled and entered the book with an eagerness that’s often lacking when I read other books that prescribe a rigid list of rules and “shall nots.” Sofer encourages readers to use this book as a field guide, to try the suggestions and see how they work, and to start small, in low-stakes situations. Fluent, open communication develops w This brilliant book opens with a perfect analogy: “Communicating is a bit like learning an instrument. Playing scales is essential, but the aim is to make music.” I smiled and entered the book with an eagerness that’s often lacking when I read other books that prescribe a rigid list of rules and “shall nots.” Sofer encourages readers to use this book as a field guide, to try the suggestions and see how they work, and to start small, in low-stakes situations. Fluent, open communication develops with practice, he notes, and this book provides useful approaches to help you learn how to put your own nonviolent communication into practice, and into the world. If you pause to let those concepts settle, the basic framework is clear: be present, be curious, and stick with the part that really matters. As I think about my own instances of difficult and ultimately unsuccessful communication, it’s easy to spot the places I went wrong. I got lost in my own stuff and was busy fighting old battles instead of talking to my conversation partner in the moment; I was defensive (or he was defensive and I reacted); or we got off track and I went down one rabbit hole after another, until neither of us even remembered where we started. I imagine any one of those experiences is familiar to you, too. Were these “violent” communications? Perhaps not as we may think about it: I didn’t hurl the dishes against the wall or threaten my conversation partner, but neither did we come out of the conversation feeling better, or closer, or ahead of where we started. As Oren notes, intimacy is born in conflict, and if conflict cannot be navigated, intimacy withers and dies. Except for the final chapter, “Conclusion,” each chapter provides a clear and thorough introduction to the topic at hand, gives the reader lots of opportunities to pause and reflect, and presents practices to help the reader put the material into action. Each also ends with a set of relevant principles, key points, and a few Q&As that came from actual workshops and seminars. For example, Chapter 6 (Don’t Let the Call Drop) focuses on listening – a critical part of communication, even if it’s not the one you think of first. Lessons in this chapter focus on listening wholeheartedly, staying connected, reflecting before you respond (I wanted to italicize the word before), identifying your own roadblocks to empathy, and conclude with three ways to practice empathy. The key principle noted at the end of the chapter recognizes that “People are more likely to be willing to listen when they feel heard. To build understanding, reflect before you respond.” The Q&A section for this chapter deals with the question of a conversation partner wanting advice, and dealing with others who expect you to communicate in a certain way. From beginning to end, Chapter 6 teachers the interested reader everything she needs to know about how to listen effectively – which means learning ways to allow the other person to feel heard and understood, and ways the listener can understand what is really going on. Every reader is likely to read one chapter that is their own long-term sore spot. For me, it was Chapter 11: If You Want Something, Ask For It. Oh, the many ways we have of “communicating” what we want, and oh, those many ways that fail to communicate what we want. The opening example in this chapter involved a young woman with chronic pain. Her family was moving, and she needed to pack her boxes, but her pain was so great that she could only lie down. Why hadn’t she asked her parents or friends for help? It had never occurred to her. People sometimes just hope that others will see and understand what they need without their having to ask, or they ask in a passive way, or in an “I don’t want to bother you” way. The other person might figure out what we’re hoping they’ll do for us, but there is a much easier way, and that’s simply to ask – a revolutionary idea! Sometimes we’ll be asking for help (“Can you help me with this box?”) and other times we’ll be asking about understanding (“What are you getting from what I just said?”). At times we will need to say no to a request for help, and undoubtedly there will be times when someone else says no to our request. This helpful chapter covers the range of situations in which we ask for help, or someone asks for our help, with clarity and compassion, and with the clear goal of understanding and connection. The short concluding chapter integrates the basic principles outlined in the book, provides possible next steps, and leaves the reader with the understanding that communication is not about the words you say. It’s not about memorizing a set of rigid rules – say this and don’t say that whatever you do – but is instead about looking inside yourself; listening to others with openness and a heartfelt intention to understand; and saying what you mean, clearly and in the moment, and with a focus on what matters. I was left with a feeling of optimism, and an eagerness to practice these methods. The book ends with a useful set of back matter: A summary of principles, a set of useful communication phrases, notes, a glossary, a list of further resources, and an index of the practices collected in the book, many of which link to a companion guided audio exercise on the author’s website. Each section focuses on one of these three steps in great detail because well each that might sound simple, it is definitely not always easy to communicate this way! The author compares learning new communication skills to learning a new language and urges us to take our time and follow the practical suggestions throughout the book. I can honestly say that following the suggestions and “learning this new language“ is having a positive effect on my life and on my relationships. The topic of communication fascinates me. Whether between two people in an intimate one-on-one conversation or between a professional speaker and her audience, effective communication is both a skill that can be learned and an art that can be mastered. So when I was asked to review the new book, Say What You Mean, by Oren Jay Sofer, I jumped at the opportunity. Before digging The topic of communication fascinates me. Whether between two people in an intimate one-on-one conversation or between a professional speaker and her audience, effective communication is both a skill that can be learned and an art that can be mastered. So when I was asked to review the new book, Say What You Mean, by Oren Jay Sofer, I jumped at the opportunity. When I read that this book applied mindful practice to communication skills I was worried that it would a metaphysical junk. I was wrong. This books takes a very practical approach to mindfulness with some common sense approach to improving communications. The book is filled with practices and examples that I use daily. Here is a brief summary of Say What You Mean by Oren Sofer. We spend so much of our lives talking to each other, but how much are we simply running on automatic—relying on old habits and hoping for the best? Are we able to truly hear others and speak our mind in a clear and kind way, without needing to get defensive or go on the attack? 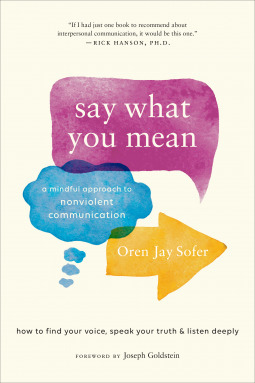 In this groundbreaking synthesis of mindfulness, somatics, and Nonviolent Communication, Oren Jay Sofer offers simple yet powerful practices to develop healthy, effective, and satisfying ways of communicating in his book Say What You Mean. Sofer is a teacher of meditation and Nonviolent Communications in both Buddhist and secular contexts. His advice is sound and the techniques he prescribes can help everyone engaged in meaningful conversation. He suggests that there are three steps to creating skillful communication. At the outset, they seem simple enough: lead with presence, come from curiosity and care; and focus on what matters. Each section of the book focuses on one step with the last section of the book fitting everything together. There are practices within each section, and I found myself underlining a lot of great information and helpful guidance. The techniques he suggests include feeling confident during conversation; staying focused on what really matters in an interaction; listening for the authentic concerns behind what others say; reducing anxiety before and during difficult conversations; and finding nourishment in day-to-day interactions. As I was looking over the book, I was thinking about a family member who has trouble expressing what he is feeling. Much of what he expresses are his current frustrations, and it takes a while to sit with him and get to the heart of the matter. Yet, when one listens closely, his love, care, and worry come out, and the conversational partner is able to discuss the important things. When I talk with him, I am listening for the authentic concerns behind what he is saying. I hate chit-chat, primarily because I am no good at it, and I hate meet-ups and parties where it is all about chit-chat. Say What You Means offers sound advice on talking about what really matters. I was privileged to read an advance copy sent by the publicist. Out today, Saw What You Mean is mindfulness in action. I really enjoyed this book. My background has mostly been in mindfulness and until now I didn't know much about different communication strategies. I thought this book was going to be just mindful communication but it also integrates a school of thought called Non-Violent Communication, a system created by Marshall Rosenberg. The book is a good mix of stories, theory, and practices to try out at home. It felt like I took a class with Oren while reading the book. One of my main takeaways has been I really enjoyed this book. My background has mostly been in mindfulness and until now I didn't know much about different communication strategies. I thought this book was going to be just mindful communication but it also integrates a school of thought called Non-Violent Communication, a system created by Marshall Rosenberg. The book is a good mix of stories, theory, and practices to try out at home. It felt like I took a class with Oren while reading the book. One of my main takeaways has been to try to be more aware of how my past conditioning and background emotional state affect how and what I say. So many of those factors, like just how we are feeling that day, control how we communicate without being fully conscious of them. That's where mindfulness comes in to play. This is one powerful book! I found it full of very helpful, relevant advice aimed at improving communications of all kinds. It is not a book to be read quickly; if you do so, you will miss the opportunity to absorb what is being said and you won't be able to apply the principles successfully. This book happened to come to me at a time when a treasured relationship had become rife with hurt and misunderstandings. Interactions were difficult for fear of saying the wrong thing, or in the wrong way. This is one powerful book! I found it full of very helpful, relevant advice aimed at improving communications of all kinds. It is not a book to be read quickly; if you do so, you will miss the opportunity to absorb what is being said and you won't be able to apply the principles successfully. This book happened to come to me at a time when a treasured relationship had become rife with hurt and misunderstandings. Interactions were difficult for fear of saying the wrong thing, or in the wrong way. I am so thankful that this book has wise ideas on how to deal with just such a situation! I highly recommend this book to anyone interested in better communications, better relationships, and self-improvement. Many thanks to NetGalley and Shambhala for allowing me to read an advanced copy of this book in exchange for an unbiased review. Best resource available on communication. This very well may be the best resource available to develop better communication skills in relationships. If you are interested in learning about this subject this book will be an invaluable resource. It provides a nice balance of theoretical background and practical applications. The only possible criticism I can see with this book is its length. If one is not keenly interested in the subject material it would be easy to shy away from reading the book Best resource available on communication. This book will not end up in that stack on your night stand. My copy is marked with color-coded post-its and dog-eared pages. Not only will it help readers understand "what went wrong" in trouble communication of the past, but it will help you build awareness, understanding, and better habits for more successful communication of the future. Sofer is expert at blending mindfulness with interpersonal communication, then applying it to real-world scenarios. I am so grateful for this tool. I wish I This book will not end up in that stack on your night stand. Love this deep book about mindful communication. It has practices, practical tips, real life examples, and so much more! I cannot emphasize enough the value in the practice sessions. The writing style is also so clear and well thought out. I have tried these techniques of Oren’s multiple times and have had great success. Get the book. You won’t regret it! Brilliant! By far one of the best and most practical books on communication out there. Oren combines NVC with a strong mindfulness background and organizes the book to highlight key points. I try to be a minimalist and read library books but I’m actually going to buy this one to keep as a resource. It’s the kind of book to read over and over because communication isn’t always so effortless. I didn't actually finish this. I wanted to like it, but I couldn't get it to it enough to keep momentum. I don't necessarily think that it wasn't good, it maybe just wasn't the right time for me to read it. Brilliant teacher and book. Easy to read, engaging and follow. Incorporates NVC, mindfulness, presence, empathy, somatic awareness, and embracing feeling as foundations for skillful communications filled with authenticity and heart. Probably the best book on communication I’ve read. Oren takes us through the tools we need to mindfully communicate. Throughout the book there are practical exercises and meditations to help reinforce the principles discussed. If you want to try understand how your words or lack of words can transform your conversations this book is for you. In a world of political correctness and technology distractions, this book helps you navigate the waters of communication. Well thought out and laid out for all readers. This book is transformative. I am so grateful for Oren Jay Sofer’s insight. This is a really helpful book to learn more about how to communicate with empathy and compassion. I love it! Lots of great info and clearly written. It was a slow read for me because of the nature of the material. The book is very practical. It is not one that you just skim through, there are exercises here and there, you can stop and actually do them. Love it! If you think the way you communicate works, chances are you could still learn more from this book. Outstanding! More of a review to follow soon! For the most part I loved this book (: Oren Jay Sofer writes clearly, helps the reader navigate through each exercise, uses concrete personal experiences to illustrate his ideas, and is especially helpful with a "Questions & Answers" ending to each chapter, which helps us to better understand the concepts he is presenting to us. I was very upset by his use of a quote from former President - and war criminal - Barack Obama. The quote itself was fine, the problem is the hypocrisy. President Ob For the most part I loved this book (: Oren Jay Sofer writes clearly, helps the reader navigate through each exercise, uses concrete personal experiences to illustrate his ideas, and is especially helpful with a "Questions & Answers" ending to each chapter, which helps us to better understand the concepts he is presenting to us. I was very upset by his use of a quote from former President - and war criminal - Barack Obama. The quote itself was fine, the problem is the hypocrisy. President Obama terrorized millions of people, presided over "terror Tuesdays", rained hundreds of thousands of bombs on other human beings, destroyed countries, families, animals. He is NOT a peaceful person! His words and actions have never been in alignment and it's incredibly important that words and actions be congruent. I was very turned off by his use of the quote from someone who is not a peaceful person, who used words to mask his non-peaceful actions, and persuaded people to go along with heinous crimes against humanity. He could have found a similar quote from someone who is actually peaceful and it would have solved the problem. Being careful with your words is really important and quoting someone who is such a heinous criminal is not O.K. (this would be true of all imperialist corporate war politicians regardless of their political party). “Say What You Mean: A Mindful Approach to Nonviolent Communication” by Oren Jay Sofer is a book I’ve long needed to read, as my hubby says I can “never land the plane” when I’m speaking to him! I’m so glad I found this incredibly helpful guide for improved connection through better communications with others! I learned to speak and listen more effectively based on the author's unique approach that mixes mindfulness practices with the principles of nonviolent communication, a popular modality sinc “Say What You Mean: A Mindful Approach to Nonviolent Communication” by Oren Jay Sofer is a book I’ve long needed to read, as my hubby says I can “never land the plane” when I’m speaking to him! I’m so glad I found this incredibly helpful guide for improved connection through better communications with others! I learned to speak and listen more effectively based on the author's unique approach that mixes mindfulness practices with the principles of nonviolent communication, a popular modality since the 1960s that posits that all human beings have the capacity for compassion when peaceful strategies are at the ready. Oren's method teaches three steps: presence, intention and attention. The steps are accompanied by practical exercises that direct readers on how to apply them to personal and social relationships with romantic partners, friends, colleagues, and family. Highly recommended! Thanks to Shambhala Publications, Inc. and NetGalley for the review copy. Opinions are fully mine.